New Yankee Workshop and Norm Abram Fans! Why Predrill Screw Holes? David: Q. I think predrilling screw holes is a real drag, so I rarely do it. Most screws seem to work fine without all that bother. Why are you always advocating predrilling? A. Call us old fashioned, but when you?re working in solid wood, we believe you?ll get the most effective and longest-lasting fastening power from screws when you drill correctly sized clearance and pilot holes. First, drill a pilot hole through both boards. Pilot holes guarantee that your screw won?t break off and your wood won?t crack. For most hardwoods, the pilot hole should be at least as large as the screw?s minor diameter. 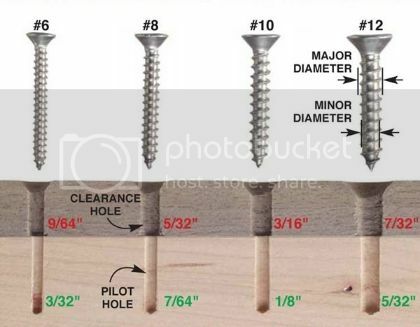 If the screw has deep threads, or the wood is very hard, the pilot hole should be another 1/64-in. larger than the minor diameter. For softer woods, the pilot hole can be 1/64-in. smaller. Skipping the pilot hole, or drilling one too small, can create hairline cracks in solid wood and MDF. Visible cracks are obviously bad,but other cracks that are too small to see can eventually widen and cause the joint to fail. Second, enlarge the pilot hole in the top board to make a clearance hole. This larger hole allows the screw to pull the two boards together. The clearance hole should be at least as large as the major diameter of the screw. Skipping the clearance-hole step often results in a small gap between the two boards you?re joining together. Glue won?t effectively bridge a gap larger than the thickness of a piece of paper.